"Last night a friend from Baroda called. Weeping. It took her fifteen minutes to tell me what the matter was. It wasn't very complicated. Only that Sayeeda, a friend of hers, had been caught by a mob. Only that her stomach had been ripped open and stuffed with burning rags. Only that after she died, someone carved 'OM' on her forehead. Precisely which Hindu scripture preaches this?" - asks Booker prize winner novelist, Arundhati Roy in her article, Democracy: Who is she when she's at home? NO, none of the Scriptures of Hindu Religion, one of the most tolerant and inclusive religion on the face of earth preach violence and killing thy Neighbor. Yet those who fuel their violence and hate, use religion over and over again to claim their own agenda. On October 22nd, 2007 (yes it took 5 years to just uncover it, thanks to government level involvement in covering up this), Tehelka, India’s leading investigative Magazine has captured the criminals on Camera, admitting their involvement in the genocide, and deliberate annihilation of Muslims. All the while police did nothing to stop the carnage. The Chief Minister apparently gave three days to the extremists to clean out anybody who is Muslim in Godhara, Gujarat.
.: Brave Journalism of Tehelka dot com that exposes Truth and Reality / few years back i worked in national media (daily and monthly publications on different capacity such as coordinator, technical editor and executive editor) involving IT (information technology) journalism, mostly focusing on personal computing. that time i developed a deep appreciation for journalism as it can be a noble service for upholding the truth and intellectual engagement about social justice. i found Tehelka dot com's brave journalism for the cause of truth very inspiring and at the same time it is a good story to make the point that a terrorist has no religion but Terrorism and Terrorism is no 'ism' of any Religion. The sad incident of killing of thousands of innocent muslim civilians by extreme hindu nationalists and terrorists do show that terrorism can not be tagged single handedly with any religion. this problem can well surface in Northern Ireland or in Serbia among violent people who might call themselves Christian, can surface in India among hate-mongering people who call themselves savior of Hindu religion or anywhere else under any religious banner. 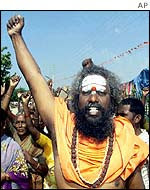 Some of the most notorious ultra nationalist groups in India that use extremism behind Hindu religious banner include the hate-spewing Shiv Sena, Vishwa Hindu Parishad (VHP), the lumpen members of Bajrang Dal, the violently anti-Muslim and anti-Christian branch of the VHP and the radical Hindu outfit Rashtriya Swayam Sevak Sangh (RSS). 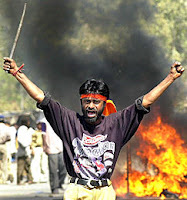 Tehelka, the magazine that pioneered the use of sting operation has now compiled an exhaustive report on the Gujarat riots. The various reports that give you a chilling account of what actually went down and this is entirely in the words of the people who perpetuated those crimes. Tehelka’s reporter, Ashish Khetan spent six months undercover as a pro-Hindutva researcher investigating and talking to the people who carried out the attacks against Muslims. The revelations are mind-numbing and make you shake your head in disbelief and horror to the extent man can fall in causing harm to his fellow beings. The painstaking investigation uncovered a web of lies entwined with truth, a mash of fact served up with fiction. In an extra-ordinary investigation it shows how corrupt and sickly religious motifs can be directed to propagate violence and hate. [>] The Truth of Godhara Gujarat 2002 / One of The Most Important Story of Our Time that exposes why terrorism in the name of religion is no '-ism' of Religion. [>] detailed sections and story here. Several spiritual and religious leaders including Sri Sri Ravi Shankar and Swami Agnivesh Saturday said that those behind Gujarat's communal violence of 2002 'should be ex-communicated from the Hindu fold'. :. Updates | this is part of an ongoing uncoving of events. check here to get latest updates.